Following a dominant performance in his fifteenth successful title defense in which he added the IBF World Middleweight championship to his unified crown against former world champion David Lemieux in October of last year, undefeated unified WBA/IBO/IBF Middleweight world champion Gennady Golovkin clearly established himself as the number one fighter in the Middleweight division. After fifteen successful championship defenses and twenty-one consecutive knockouts, anticipation has only increased for Golovkin to get an opportunity to face a marquee star of the sport. It is hard to argue that one of the most anticipated potential fights of 2016 is not a potential clash between the “Knockout Artist” Golovkin and newly crowned WBC world champion Saul “Canelo” Alvarez, a fighter who is a legitimate star of the sport of Boxing. Alvarez however, will make the first defense of his Middleweight world championship against former unified Jr. Welterweight world champion Amir Khan on May 7th in Las Vegas, NV. Rather than sit on the sidelines for a potential bout against the winner of that fight, Golovkin will also return to the ring as it was announced last week that he will make the sixteenth defense of his world championship against undefeated IBF number three rated contender Dominic Wade on April 23rd at The Forum in Inglewood, CA. 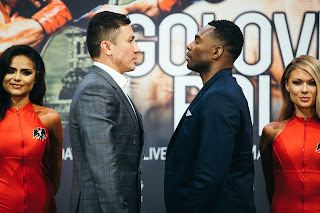 Golovkin, who will enter the fight with a record of 34-0, with 31 Knockouts faces what could be an interesting battle against Wade, who will enter the ring unbeaten in eighteen professional fights having scored knockouts in twelve of those bouts. Although some might be tempted to state that Wade could be inexperienced, despite being undefeated in eighteen fights, he is coming off of a victory over former IBF Middleweight world champion Sam Soliman in June of last year. It is likely however, that Wade will find himself in a similar position as most previous Golovkin opponents as a considerable underdog due in large part to Golovkin’s reputation as a “Knockout Artist” as well as his ongoing knockout streak. It will be interesting to see however, whether or not talk of a potential fight between Golovkin and Saul Alvarez possibly impacts how the champion approaches this fight. Even though Wade is unbeaten and coming off of the biggest victory of his career against Sam Soliman, it is important to remember that Golovkin has been on what this observer has called a path of destruction through the Middleweight division while waiting to secure a lucrative fight against a fighter recognized as a star in the sport. With a potential fight with the winner of Alvarez-Khan possibly on the horizon for Golovkin and having scored twenty-one consecutive knockouts in mostly dominant fashion, it will be interesting to see whether or not the champion will approach this fight looking for a knockout right out of the gate, or if he will continue to implement the tactical seek and destroy style that has made him one of the hottest rising stars in the sport. The question that will be asked of Dominic Wade is the same as virtually every previous Golovkin opponent. Can he provide the champion with a significant test and it will be interesting to see what Wade brings to this fight. The announcement of Golovkin-Wade does add some intrigue to the upper echelon of the Middleweight division in the coming months as it certainly sets up a scenario where the winner of this fight could face the winner of Alvarez-Khan later this year. Although this observer looks forward to providing further analysis on both fights as they get closer to taking place, if such a scenario were to indeed lead to further unification of the Middleweight division both fights should be viewed as a positive for the sport, despite the likelihood of both champions being heavily favored over their respective challengers. If what essentially would amount to a four fighter box off is indeed what is in the works, the ultimate benefactor will be Boxing fans.